Congratulations! We look forward to celebrating with you! In this section you will find answers to frequently asked questions regarding graduation requirements, procedures and deadlines. Please also consult the degree requirements listed in the Graduate Bulletin as well as your graduate program coordinator or director for details concerning specific program requirements. If your question is not answered here, contact us at GradGraduation@stonybrook.edu. Before filling out the online form to apply for graduation, please review the FAQs below as well as the instructions detailed on the Application for Graduation page. The thesis and dissertation guidelines section outlines the steps involved in preparing your electronic thesis or dissertation submission and lists the additional required documents students must submit to the Graduate School. This section also has links to theses and dissertation templates. Download and complete the Doctoral Defense Announcement form. Email the completed form to your graduate program director (GPD) for review and approval. The GPD or designated delegate should then email the approved form, as an attachment, to GradRecords@stonybrook.edu at least three weeks prior to the proposed defense date. The form must be saved and emailed to the Graduate School in PDF format; the file name cannot contain any special characters, including apostrophes ('), commas (,), colons (:), or semicolons (;). An example of an acceptable file name is LastName_FirstName_1 June 2017_ddd.pdf. Once approved, the Graduate School will post the announcement on the Doctoral Defense Announcement page. 1. Students must be registered for the semester in which they intend to graduate. Spring (May) and Fall (December) candidates must register for at least one graduate credit. Summer (August) candidates may register for zero graduate-evel credits in either summer session. 2. Students must apply for graduation for the semester they intend to graduate. If degree requirements are not met, students must submit a Change of Graduation Date form for a subsequent degree-awarding period . Applications are not carried forward. 3. Students must achieve a 3.0 overall GPA in all graduate courses taken at Stony Brook. 4. As part of the Graduate School’s continued initiative to ensure student satisfaction, we ask that all graduate students, both master's and doctoral, complete the Graduate School Exit Survey before leaving the university. Results are kept completely confidential. Doctoral students should also complete the National Research Council’s Survey of Earned Doctorates . https://sed-ncses.org/GradDateRouter.aspx. Both survey's should be completed after you submit your application for graduation. NOTE: Students need to apply for graduation regardless of whether they want to attend any of the graduation ceremonies. Students obtaining master’s degrees while pursuing a doctoral degree need to apply for graduation for the master’s degree. 1. Students must obtain at least 30 credits of graduate work. Check with your program for specific credit amounts. 2. Students who are preparing a thesis for submission to the Graduate School, if required by their program, must submit the final version of their thesis to the Graduate School by the posted deadline. The format of the thesis must be prepared according to the appropriate guidelines. 1. Doctoral students (with the exception of DMA students) must be advanced to candidacy (G5 status) for at least one year prior to graduating. 2. Doctoral students must have their defense committee approved by the Graduate School. The program needs to send a Committee Approval Request form to the Graduate School four weeks prior to the defense date. NOTE: Students do not fill out this form; the form is prepared by and sent by the program to the Graduate School. 3. Students must have their defense announcements posted, and must fill out a Doctoral Defense Announcement form. Students should email the completed form to their graduate program director (GPD) for review and approval. The GPD or designated delegate should then email the approved form as an attachment to GradRecords@stonybrook.edu at least three weeks prior to the proposed defense date. NOTE: Failure to have a Doctoral Defense Announcement form submitted to the Graduate School according to procedure and in a timely manner may result in students defending their dissertations a second time. 4. Students must submit the final version of their dissertation to the Graduate School within three months of a successful defense. Students must submit by the posted semester deadline if they intend to graduate that semester. For example, a student must submit by the posted deadline for May 2017 if they intend on graduating in May 2017. The dissertation must be prepared according to the appropriate guidelines. 5. Doctoral students are asked to fill out the National Research Council’s Survey of Earned Doctorates. The survey is available online at https://sed-ncses.org. Students do not need to provide hard copies of this survey to the Graduate School. Please note, all graduate students, even those who do not plan on attending graduation ceremonies, must still apply for graduation. Master's candidates should apply online via their SOLAR Account by Wednesday, April 17, 2019 for Spring/Summer 2019 graduation in order for their name to be included in the Commencement Publication. Under "Academic Records," select "Apply for Graduation." After the April 17 deadline, master's candidates must apply through the Graduate School website. PhD candidates do not have access to apply for graduation via SOLAR. This includes PhD candidates applying for their Masters along the way. All PhD candidates should apply for graduation through the Graduate School website. In order for their name to appear in the May Commencement Publication, PhD candidates must submit their graduation application by Wednesday, April 17, 2019. Once a degree application is processed in the system, an email notification is sent to students. This contains information on graduation and related procedures. Students should expect to receive this email notification shortly after they apply. For your records, please keep the summary page that appears after your application is complete. What if I need to change my degree date? Students who apply for May 2019 graduation and find later in the semester that they need to become an August or December 2019 candidate will need to submit a change of graduation date form for August or December 2019. For students that apply for August 2019 graduation and find that they need to become a December 2019 candidate will need to submit a change of graduation date form for December 2019. They should also email GradGraduation@stonybrook.edu to have their May/August 2019 candidacy removed. What if I need to change my diploma name, diploma address, or dissertation title? As long as their degree date remains the same, students who need to update diploma name, diploma address or dissertation title should not apply again. Instead, email GradGraduation@stonybrook.edu with your updated information. Any updates to the diploma address should be made before the degree is awarded. For further information, see the section Awarding the Degree below. When will my application show up on the system? Degree candidacy may not show up immediately on the system after the application is complete. The Graduate School runs retrievals of online applicants periodically, so students should expect the application to show up approximately two weeks after application. During our peak processing periods, it may take an additional week or two for it to appear. I applied for graduation, but cannot register for the semester that follows the degree date. What should I do? Sometimes students who apply for graduation will not become term activated (eligible to register) for the following semester because the system ‘thinks’ they are graduating. If you find that you need to cancel your degree application, email your program coordinator a completed Change of Graduation Date form for approval. The program will then forward the approved form to GradGraduation@stonybrook.edu. Is this application also for attending the graduation ceremonies? Students must submit the final version of their thesis (if required by program) or dissertation online through Stony Brook University's ProQuest/UMI ETD administrator site. Students must submit the final version of their thesis or dissertation on or before the deadline date to be considered for that semester’s graduation. Online submissions must be received by 4:00 pm ET of the deadline date. No extensions will be granted. Students who submit after the deadline date will become a candidate for the following semester and will need to reapply for graduation and register appropriately. Please note, the thesis/dissertation deadline date for May 2019 is Wednesday, May 22, 2019 at 4:00 pm ET. Please note, the thesis/dissertation deadline date for May 2019, SUNY-Korea candidates is Tuesday, June 18, 2019 at 4:00 pm. How and when do I submit my thesis/dissertation? Effective May 2010, students must submit theses and dissertations online. Further information about procedures is available on the Thesis & Dissertation Guidelines section of the website. No appointment is necessary. Students are always welcome to visit during our regular office hours of 8:30 am through 4:00 pm, Monday, Wednesday & Thursday. Tuesdays we have walk-in hours from 10:00 am through 3:00 pm. The office is closed on Fridays. Do I have to wait until the week of the submission deadline to submit my thesis or dissertation? International students are not out of status. A student with a tuition scholarship or TA/GA/RA will not lose funding. A student who lives on campus will not lose housing. Students retain all University privileges (such as library access) until their degree is posted to their record. How do I prepare my thesis/dissertation? Theses and dissertations must be prepared according to the guidelines, which are outlined in the Thesis & Dissertation Guidelines section of the website. Students can also reach us at GradGraduation@stonybrook.edu with any questions. In May, the university hosts two ceremonies: the doctoral hooding ceremony, where doctoral degrees are conferred, and the main commencement ceremony, where master's and bachelors degrees are conferred. The December commencement ceremony confers doctoral, master’s and bachelor’s degrees. No ceremonies are held in August. Visit Conferences & Special Events' Commencement website for current dates and times. Doctoral Candidates: To participate in a hooding ceremony, doctoral candidates must have completed their degree requirements by the Ceremony Registration form deadline. More information is available on the Commencement website. August candidates are permitted to attend the May doctoral hooding ceremony. However, they must apply for graduation and contact doctoralhooding@stonybrook.edu to notify the office of your intention to participate in May. 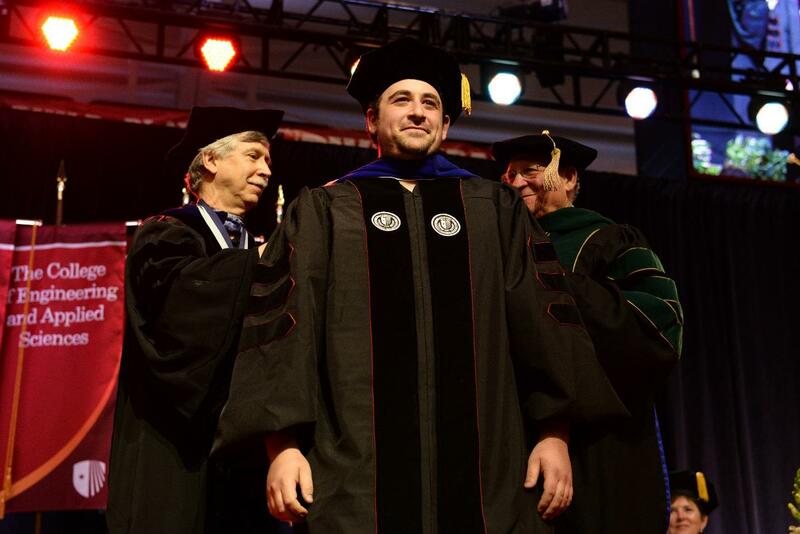 If May candidates are unable to attend the May doctoral hooding ceremony and wish to attend a future ceremony, they should email doctoralhooding@stonybrook.edu to defer their ceremony participation. Master's Candidates: The Graduate School does not have any policy regarding who can walk in the May commencement ceremony. Questions should be directed to Conferences & Special Events at (631) 632-6320 or conferences.events@stonybrook.edu . Departmental Ceremonies: The Graduate School does not have any policy regarding who can participate in departmental ceremonies. Questions should be directed to the graduate program coordinator. When is information sent out? Masters candidates will register for ceremony attendance when they fill out their Application to Graduate. Please see the Commencement website for these dates. The Graduate School will also send information about the hooding ceremony to all doctoral candidates that have Applied to Graduate on the Graduate School website. Contact the Graduate School at doctoralhooding@stonybrook.edu for any additional questions. More information is also available on the Commencement website. Programs send a completion statement to the Graduate School once students have completed all requirements for their degree. This can only happen when the semester of graduation is complete and all grades have been posted (including for the last semester). These completion statements are then reviewed and processed by the Graduate School. The Graduate School cannot review your record for clearance without first receiving the completion statement form from the program, so students should first consult with their program regarding the status of their clearance before contacting any other office. The Graduate School generally begins reviewing students' records for clearance during the third week of the month following the degree awarding date. Degree awarding dates are May, August and December. Records are reviewed in the order the completion statement forms are received. It takes approximately 4 weeks to review all candidates’ records, as the Graduate School processes an average of 500 degrees per semester. Due to the time involved, the Graduate School cannot consider requests to process certain degrees or individuals first. When the Graduate School clears students for their degree, the degree is immediately posted to their transcript. At this time, official transcripts requested from the Registrar will reflect the degree. While waiting for their degree conferral, PhD candidates can request a letter of completion for their employers. The form is available in the Forms section of our website. Master's candidates can request a letter directly from their program. It takes approximately 4-6 weeks from the date of clearance by the Graduate School for candidates to receive their diploma. The Registrar handles the diploma process with an outside vendor, and the vendor produces and mails out the diplomas. Students can view the ordered or mailed date of their diploma on their checklist through SOLAR. NOTE: Once a diploma has been ordered, the diploma address cannot be changed. Students should make sure that their diploma address is accurate before the degree is awarded. Financial holds, including those from Student Accounts, Library, or Parking Services, prevents the release of official transcripts and diplomas. Candidates should make sure all fees and fines are paid by graduation.